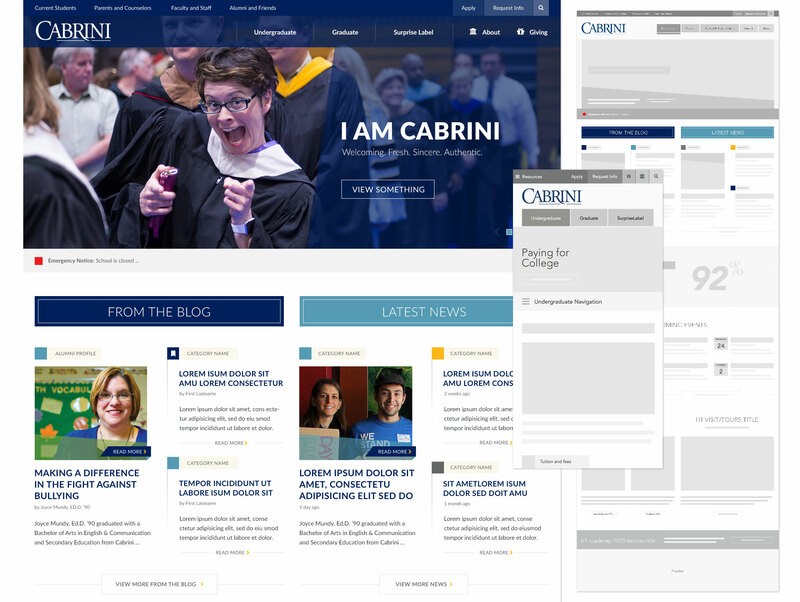 Cabrini University was undergoing a rebranding process and their website was in need of a complete overhaul and replatform. The goal was to turn a severely outdated site into a useful site focusing on the needs of the prospective students, parents, staff and other external audience groups. Research and interviews were first to gather information from each stakeholder, including students. We used this information to start creating moodboards and sketching concepts. We went through many rounds of iteration and these turned into a collection of elements and components that we would be able to use throughout the site. Next, I set up a living style guide to build a library of available elements to use in order to avoid one-offs moving forward. At the same time, I began working on wireframes for the important page templates so we could map the elements to the wireframes during development. This way, we could avoid have to create costly mockups that would require never-ending edits to get it perfect before the ol' sign-off. We ended up with only creating two complete mockups in order to showcase at a pre-launch event and this saved everyone time and money.